Laser Hair Removal is the best solution to ridding yourself of unwanted body hair. Other ways of managing your unwanted hair – like waxing or at-home devices – are more painful, less effective and more time consuming than laser hair removal. 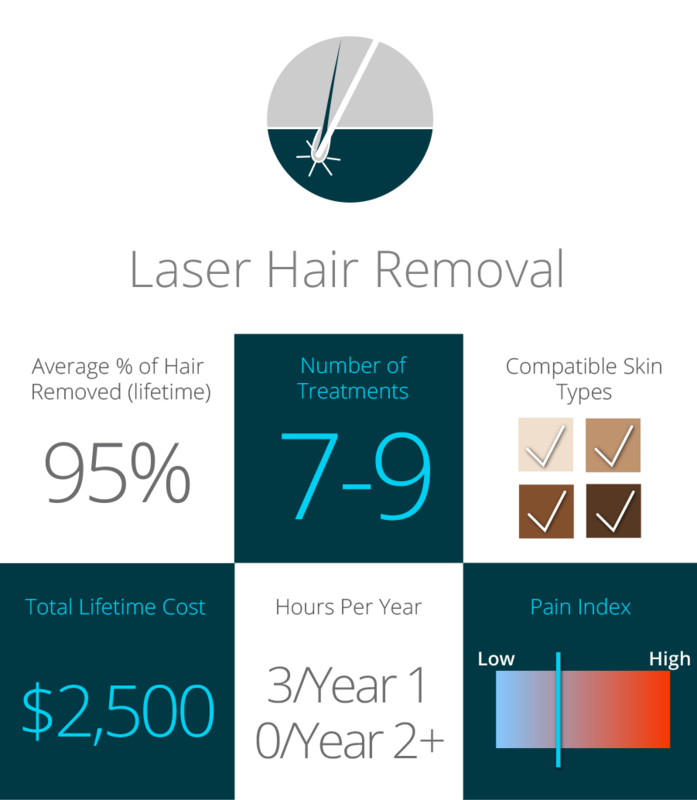 On average, Milan laser clients see a 95%+ reduction in unwanted hair in treated areas in 7-9 treatments. Our lasers can safely remove hair on all skin tones. 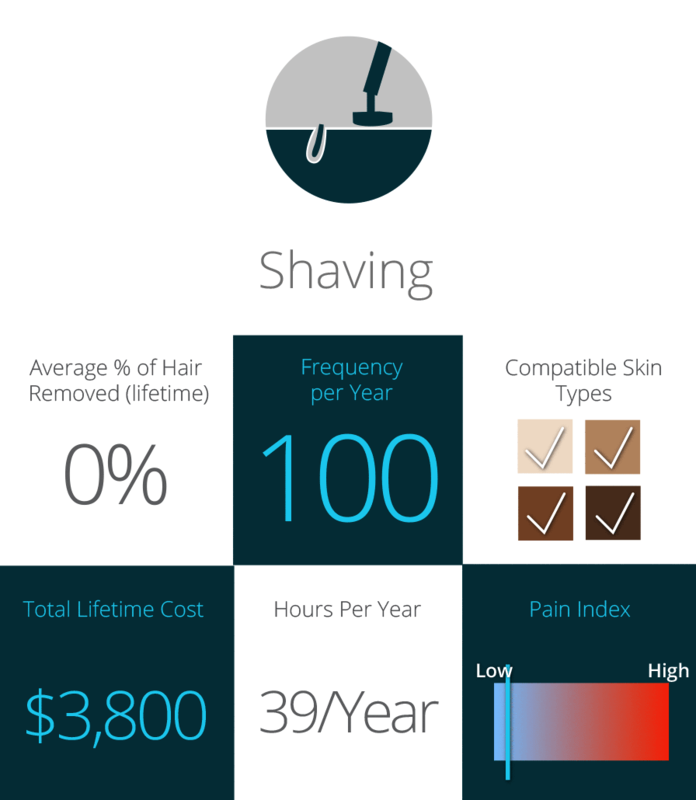 Laser hair removal costs roughly the same as at-home devices, but with permanent (and better) results in less time & with less pain. Additionally, you do not have to let the hair grow out in order for laser hair removal to be successful. In fact, it's required that the area be clean shaven on the day of your treatment. Find out how laser hair removal permanently removes your hair. Most at-home devices – as well as a lot of med spas – use IPL technology to remove hair. IPL is multi-wavelength, scattered light that is generated from flash lamps & is not “true laser” light because it spreads out instead of staying in a targeted beam. When you compare IPL to our lasers (because IPL isn’t a laser!) it’s a no brainer that laser hair removal is the better solution to your unwanted hair. At best, IPL users see an 80% reduction in unwanted hair over the course of 10+ treatments. In addition to producing inferior results, these devices only work on light to medium skin tones – they severely burn darker skin tones. IPL devices (whether at-home or at a med spa) are more painful than our lasers, and require a lot more time to maintain results. Comparing laser hair removal to shaving is like comparing day to night (or that dreaded 5 o’clock shadow!). This method of hair removal only provides you with temporary results with the average person shaving 100 times per year. If that wasn’t bad enough, it takes up an estimated 39 hours of your life each year – what a waste of time! While this method can safely be performed on all skin tones, it costs an estimated $1,300 more in your lifetime than laser hair removal. On top of that, you have to let the hair grow out before you can shave it off…with laser hair removal there’s no need for embarrassing stubble. Discover all the areas that you could stop shaving – saving you time and money! When comparing laser hair removal to waxing, it’s important to note that waxing is significantly more painful than removing body hair with a laser. Waxing does work on all skin tones – but costs nearly 10 times as much in your lifetime than laser hair treatments. Additionally, you’ll also need to devote 8 hours of your life each year to going to 10 or more waxing appointments to maintain results. As if stealing your precious time, being more painful and more expensive wasn’t enough…you also have to let embarrassing stubble grow before each appointment in order for it to be effective! 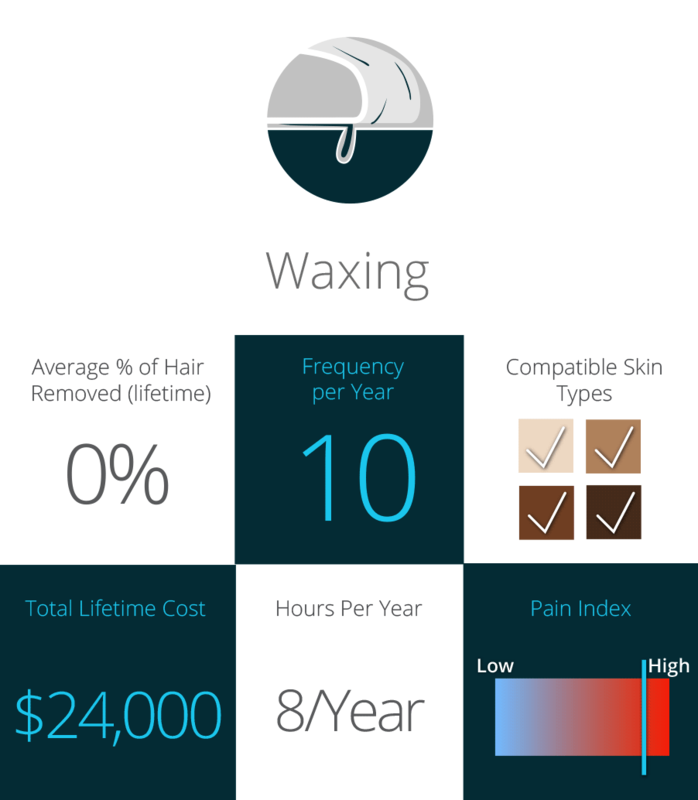 Learn more about the drawbacks of waxing and why laser hair removal is your best solution to unwanted hair.